As one of the most affordable handgun rounds throughout ranges across America, the 9x19mm parabellum is here to stay. 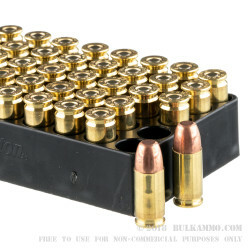 This Remington 147 grain 9mm Metal Case ammo is an affordable, yet clean burning range ammunition that is well suited for shooters looking to further hone their skills at the range. 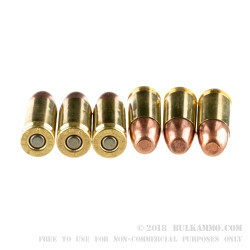 The round nose flat point, copper full metal jacket rounds have an inherently flat trajectory in flight, and can be accurately fired out to ranges of 25 yards and beyond. 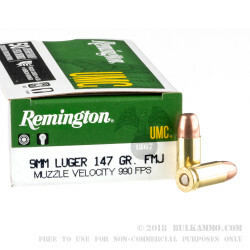 Due to the rounds subsonic average muzzle velocity of 990 feet per second, the Remington 147gr 9mm Metal Case has an inherently quite sound signature when used with suppressor based weapons systems, and can be fired from both wet and dry suppressor systems. Virgin brass cartridges prevent premature wear of extractor and ejector components within your firearm, and can be easily cleaned and reloaded for shooting enthusiasts looking to squeeze the most out of their shooting budget. 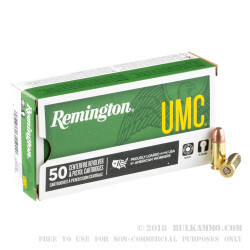 If you are looking for a no thrills, reliable training ammunition that will get the job done under any circumstances, than the Remington 147gr 9mm Metal Case is just the round for you. Q: What the typical FPS for this ammo. A: Hello! The typical velocity for a 147 grain 9mm round is right at 1000 fps.